t’s almost time to bid farewell to 2017 and say hello to the New Year! Connecticut restaurants are celebrating 2018 with epic parties, prix fixe menus, and hangover brunches. Here is what they have in store! Washington Prime, Norwalk Washington Prime in SoNo's NYE Dinner has 3 Seatings: 4pm, 6pm, and 8:30pm. It includes selection of appetizer, entree, and dessert and costs $65 per person plus tax & gratuity. The Cottage, Westport: The Cottage in Westport presents a New Years Eve Brunch followed by a New Years Eve Celebration Dinner from 5:30-10:30pm. The a la carte menu will include lots of caviar, truffles, and buttered lobster! Griswold Inn, Essex: The Griswold Inn has NYE Dinner Seatings starting at 5:30 pm and the Shiny Lapel Trio will play from 10pm-1am. Entrees include Pan Seared Atlantic Salmon, Roasted Long Island Duck, Roasted Prime Rib, and Filet of Beef Wellington. It costs $60 per person, plus tax and gratuity. Present Company, Simsbury: Present Company's 5 course prix fixe NYE dinner includes options like lightly roasted cauliflower carpaccio with black truffles and beef “wellington” with mushroom stuffing. It is $110 per person with wine pairings available for an additional $40. Harlan Publick, Norwalk: Beginning 12/31 at 9:30pm, dance the night away and enjoy craft cocktails and a chefs buffet at Harlan Publick in Norwalk. Barcade, New Haven: Barcade's New Year's Eve Party in New Haven will feature a Champagne toast at midnight, as well as a special tap list put together just for the occasion. No cover charge and no advance tickets needed! Walrus + Carpenter, Bridgeport: Spend New Year's Eve at a Masquerade with the Pocket Hotties at Walrus + Carpenter in Bridgeport. Basso Cafe, Norwalk: For Basso Cafe's New Years Eve celebration, they will serve an a la Carte menu with festive additions starting at 5pm. There will be live music from 8pm-1:30am. Fresh Salt @ Saybrook Point, Saybrook: Ring in the New Year at Fresh Salt, located in Saybrook Point Inn, Marina & Spa. They'll have a raw bar, passed appetizers, a full sit down dinner, a premium open bar, a Champagne toast, and assorted desserts. The Cartells will provide live entertainment. It costs $139.95 per person, plus tax and service charge. elm, New Canaan: elm New Canaan's NYE menu includes three courses, with an additional pasta course available for $45 more. It costs $95 per person, plus tax and tip. Cafe on the Green, Danbury: Visit Cafe on the Green for a 5 course prix fixe dinner on NYE or join them the next day for New Year's Day brunch. Copper Beach Inn, Ivoryton: Join The Copper Beach Inn for a spectacular evening of dining, music, and New Year celebration featuring a custom a la carte menu. Riverview Bistro, Stratford: Riverview Bistro's NYE celebration includes a 5 course dinner, an open bar, a photo booth, a midnight toast, and dancing with Music in Motion. Millwrights, Simsbury: Millwrights in Simsbury, led by Top Chef contestant Chef Tyler Anderson, will have two New Year's Eve seatings. The first features 4 courses, runs from 5-6:30pm, and costs $94 per person. The second includes 6 courses, runs from 7-10pm, and costs $124 per person. Shell & Bones, New Haven: On New Year's Eve, Shell & Bones's Dining Room will be open from 11am – 11pm with special dishes to complement their regular a la carte menu. The next day, join them for New Year's Day brunch from 11am - 2:30pm or in the dining room from 11am-10pm. Vazzano’s Four Seasons, Stratford: Vazzano's Four Seasons in Stratford celebrates New Year's Eve from 8pm-1am with an open bar and dinner. They'll even send you home with a bacon, egg, and cheese sandwich for the trip back! Aspen, Old Saybrook: El Segundo will be open for brunch on New Year's Eve and New Year's Day, though they will be closed the night of NYE. Treva, West Hartford: Treva will offer a four course prix fixe menu on New Year's Eve for $69 per guest, plus tax and gratuity. Toast with a complimentary glass of champagne at midnight. The Gingerman, Greenwich: The Ginger Man's late night party starts at 10:30pm. Join them the next day for New Year's Day brunch. East End, Greenwich: East End in Greenwich will offer a prix fixe menu from 9pm-12am, with entertainment by Love Russell. Market Place, Woodbury: At Market Place in Woodbury, enjoy a 3 course prix fixe menu for $65 per person, plus tax and gratuity. Entrees include Skillet Roasted Scallops, Braised Veal, and more. Conspiracy, Middletown: Conspiracy in Middletown is open for dinner from 5pm-1am on New Years Eve, with special sparkling cocktails all night and a midnight toast. They are open regular hours on New Years Day. Cask Republic, Stamford and Norwalk:At Cask Republic New Haven, the NYE party begins at 10:30pm, where $35 includes a buffet and two cocktails. The South Norwalk and Stamford locations will have 3 course prix fixe menus followed with late night. b restaurant, Glastonbury:b restaurant in Glastonbury hosts a Hangover Brunch on New Year's Day. Entrees range from $9-$16 and bottomless Mimosas and Bourbon Sours are available for $15. Tisane Euro-Asian Cafe, Hartford: Tisane Euro-Asian Cafe invites you to New Year's Day Brunch from 10am-3pm. Drink specials include $5 Mimosas, $6 Bloody Marys, and $22 Bloody Mary Pitchers. El Segundo, Norwalk: El Segundo will be open for brunch on New Year's Eve and New Year's Day, though they will be closed the night of NYE. The Spread, Norwalk: Go to The Spread in Norwalk for NYE dinner followed by a party with DJ, dancing and a midnight toast. There is no cover charge. Pacifico, New Haven: Pacifico in New Haven will be serving a 4-course prix-fixe menu and a variety of chef specials until midnight! There will be a DJ and free champagne for a midnight toast. Johnny Utah’s, Norwalk: Party til 2018 at Johnny Utah's in Norwalk with an open bar, dinner buffet, and a DJ! General admission tickets are $50. At the Barn, Granby: At the Barn in Granby presents a prix fixe menu, their regular dinner menu, and specialty cocktails in honor of NYE. Dinner seating begins at 4pm on December 31. The prix fixe menu includes 3 courses for $55 per person. THC, Derby: Ring in 2018 with THC in Derby! A $25.00 Cover (plus tax and admin fee, purchase ahead of time or at the door through Eventbrite) gets you one FREE drink and a DJ party. Barcelona, Stamford: Join Barcelona Stamford special tapas and cocktails on New Year's Eve. Bartaco, Stamford: If you want to end 2017 with tacos and margaritas, Bartaco is open on December 31 for all the NYE festivities. Brother Jimmy’s, Stamford: Brother Jimmy’s BBQ Stamford has party packages available between 9pm-1am for individuals and groups. They'll have a complimentary dinner buffet and a champaign toast at midnight. Coalhouse Pizza, Stamford: At Coalhouse Pizza in Stamford, a $75 ticket ($90 at the door) includes an open bar and plenty of live entertainment. Serving begins at 9pm. Del Fresco’s, Stamford: Del Frisco’s Grille Stamford will offer a special three- course prix-fixe menu featuring the Grille’s signature chef-inspired dishes and a celebratory Prosecco toast at midnight. Kashi, Stamford: Visit Kashi in Stamford from 10pm-2am for live music, a premium open bar, and a dinner buffet with a raw bar, sushi, appetizers, and entrees... for only $90! 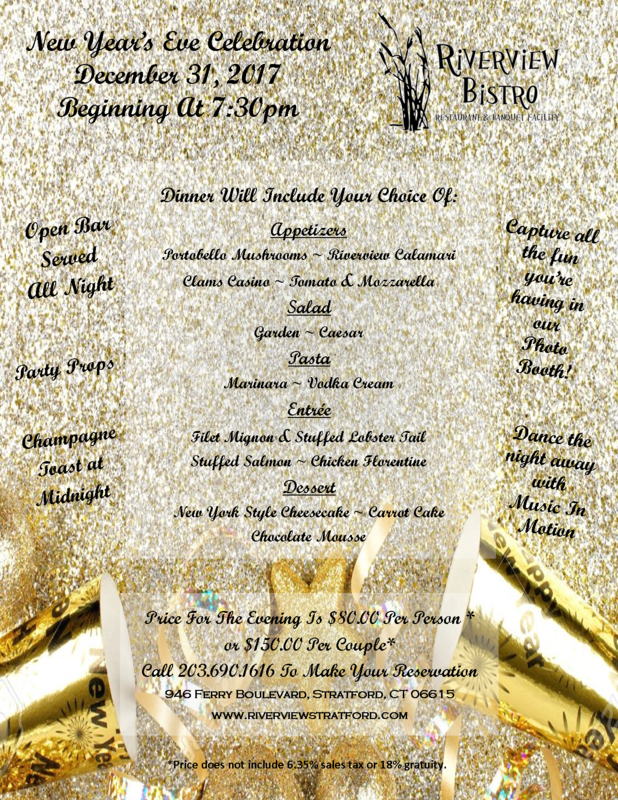 Villa Italia, Stamford: For New Year's Eve, Villa Italia in Stamford presents a 4 Course Dinner, dancing, a DJ, party favors, a photo booth, and a champagne toast at midnight. It costs$75 per person, plus tax and tip. The Blind Rhino, Norwalk: The 2nd Annual SoNo Ball Drop featuring DJ Durso will take place at the Blind Rhino this NYE. 129 Restaurant, New Canaan: 129 Restaurant in New Canaan will have a special 4 course prix fixe menu from 12pm to 1am, as well as limited a la carte menu. It is $75 pp or $95pp with wine pairings and champagne (plus tax and tip).  Sign of the Whale, Stamford: The doors of Sign of the Whale in Stamford open at 8pm. Partake in a top shelf open bar until midnight, a cocktail hour with passed bites until 9pm, a full dinner buffet, a live DJ, and a toast at Midnight. Hudson Grille, Stamford: The New Year's Eve celebration at Hudson Grille in Stamford includes dinner from 4-10pm and a toast at midnight. Pearl, Westport: Pearl at Longshore in Westport will have a special New Year's Eve menu in honor of the holiday. Amis Trattoria, Westport: Amis creates a ‘Midnight in Rome’ celebration on New Year’s Eve. They will be ringing in the New Year the Roman way with a night of Roman-style fare and fun. The evening begins at 4pm with a happy hour featuring light hors d’oeuvres that will culminate in a toast to Roman new year at 6pm. Throughout the night they’ll also feature a special 4-course prix-fixe menu available for $70pp ($35 optional beverage pairing). Cinzano's Restaurant, Fairfield is hosting NEW YEAR'S EVE EXTRAVAGANZA. $75 All-Inclusive Dinner will be served (tax & tip included) including...Prime Rib, FREE Party Favors, open bar from 8 to 11pm, complimentary Champagne Toast at Midnight & DJ. Reservations 203-903-6538.